Recent studies show gays and lesbians are slightly less likely to contract Alzheimer’s Disease than the population in general, but for years we’ve known that in most families, it is the LGBT sibling that’s more likely to end up as the primary caregiver for an ailing parent. And chances are that parent is dealing with some form of dementia. Brian Parman found himself in that position when he took primary responsibility for his mother and moved her to Dallas from Michigan. She has Alzheimer’s, the most common form of dementia, so he and his husband found a good facility for her in Oak Cliff near their home. In Parman’s case, one of his brothers was also involved in his mom’s care, but another wasn’t. His mother has had Alzheimer’s now for 15 years. Parman said the disease has progressed over that time, but she’s still able to do things. Now, he said, he’s been surprised what a gift caring for her has been. Changes in mood and personality are one of the warning signs of Alzheimer’s. Often someone who was easy to get along with becomes harder to deal with as the memory loss and confusion set in. He said her disease has progressed slowly, but he worries about the day she won’t know who he is. She already gets confused at times about who he is, but accepts his explanations. He explained she had three sons and he was one of them. “I can’t wait to tell my mom I have three sons,” she told him. Parman said he found out his mother had Alzheimer’s when his father was being treated for lung cancer, and the doctor mentioned she had signs of dementia. So they moved her to assisted living, and Parman joined the Alzheimer’s Association to learn more about the disease and what can be done about it. There’s no test for Alzheimer’s but on its website, ALZ.org, the Alzheimer’s Association lists 10 warning signs of the disease. They include the more obvious memory loss that disrupts daily life, but also changes in personality, increasingly poor judgment and withdrawal from social activities. Just as important, the list compares Alzheimer’s symptoms to typical age-related changes. Everyone makes a bad decision every now and then; with Alzheimer’s, though, it becomes a regular occurrence. Anybody might miss a monthly payment, but someone with Alzheimer’s is unable to manage their budget. And older people often forget a name or struggle for a second or two to come up with the right word; people with Alzheimer’s may be unable to have a conversation at all. But just because someone is in the earlier stages of Alzheimer’s, that doesn’t mean their life is over. Parman said one reason he decided to take over his mother’s care was that she had been in an assisted living facility where she just sat in her room watching TV. “Now she’s living, doing things,” he said. There are some drugs that can slow the progression of the disease, and research is being done on ways to prevent or reverse the damage from Alzheimer’s. But one way to slow the progression of the disease is to keep the person engaged and active. That, Parman said, is one reason he moved his mother to the assisted living facility she is in now — because it offered opportunities for her to stay active. He said until he went to an Alzheimer’s walk, it never occurred to him that it’s a disease you can die from. As plaque builds up on the brain, it slows the flow of blood, causing the outward symptoms of the disease, but that build-up may also cause mini-strokes that may eventually kill the person. Parman explained that there’s a stigma to having Alzheimer’s. He took his mom to a restaurant that didn’t have a family bathroom, so he had to bring her into the men’s room and had to explain why he was bringing her in there. While caring for someone with Alzheimer’s often leads caregivers to suffer from compassion fatigue, it took Parman in another direction. He was working at Cathedral of Hope for a short time, but was laid off due to budget cuts. He then became director of The Point and the Pavillion at CC Young near White Rock Lake, a senior living flex facility that provides the full continuum of care, including assisted living, rehab, nursing and memory care. Parman’s degree is in recreation, and keeping residents active and engaged provides better quality of life and may extend life, Parman explained. He showed off some of the projects residents participated in. Because it’s just off White Rock Lake, residents are active with Love of the Lake whose projects include keeping the shore clean. “We create the bags people use to pick up litter at the lake,” he said. To help the homeless, residents knit caps and scarves to distribute when the weather gets cold. They also create quilts from plastic bags that are cushioned and waterproof. Among other places, they’ve distributed them at BACH, the breakfast program at Cathedral of Hope. Parman’s mother is lucky to have two sons involved in her care at a time she can’t take care of herself. As an active member of Coalition for Aging LGBT, Parman said he knows many people in the LGBT community don’t have anyone to care for them as they get older. “I never thought I was going to live that long” — Parman said it’s something he’s heard over and over from people who lived through the worst of the AIDS epidemic. But people in the LGBT community have to start thinking about and planning for old age. Alzheimer’s strikes one in 10 people age 65 and older. Women are more likely to develop the disease, and studies are underway to discover why gay people are slightly less likely to contract it. But it remains a possibility and people in the LGBT community should plan for that in case they or their partner, spouse or friends begin to show symptoms. The 2018 Walk to End Alzheimer’s steps off at 8 a.m. on Oct. 13 at Dallas City Hall Plaza. Will I be safe in senior living? When going into assisted living, rehab, nursing or memory care, LGBT elders often have to think about their safety. Their choice may be between going back into the closet or finding a safe place to live. The problem is so serious, Lambda Legal has several cases in various stages of litigation about the treatment of residents in senior care. That same care should be taken not just in looking for senior living for yourself, your spouse or close LGBT friends, but also your parents. Your parent might be straight, but how will Mom or Dad be treated when you’re not there if staff knows you’re gay? Will your spouse be welcomed to visit? When it comes to you personally, look beyond safety. This is where you’ll be living; will there be anything of interest for you to do? 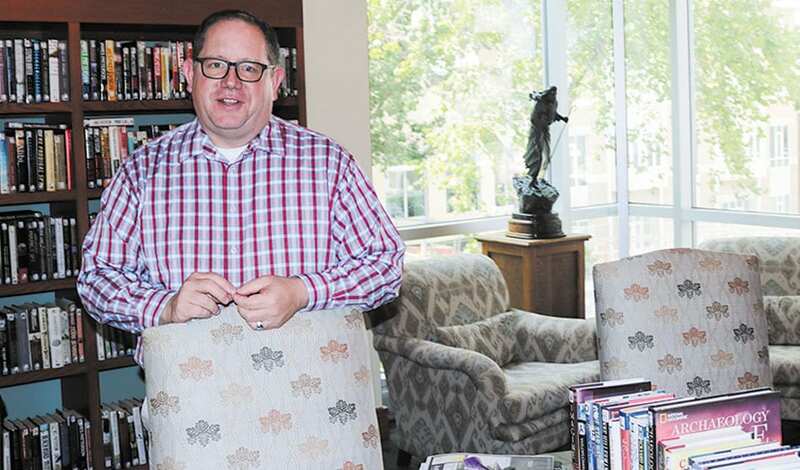 Brian Parman, director of The Point and Pavilion at CC Young Senior Living on White Rock Lake, said when you visit, just sit in the lobby for awhile and get an idea of the atmosphere of the place. How does staff interact with the residents? Do the seniors appear happy? Ask for a list of activities. Would any be of interest to you? Parman said they’ve taken residents to serve meals at BACH — Breakfast at Cathedral of Hope. Activities might not be gay-specific, but this month’s yoga classes and an art show at The Point might be of interest. Look at what’s showing on movie night. Are any of the films gay-inclusive? Look for diversity in the staff. Ask if there are any LGBT staff that you might talk to. That staff member might be the director, as in Parman’s case, or it may be a nurse or an aide. Ask if an LGBT resident would be safe and happy living there. It’s a fair question. Are there any other LGBT residents? (Some won’t be out to staff, or wouldn’t be interested in being a spokesperson). Robert Emery surveyed senior facilities around North Texas. The salesperson for the facility in each case told him that yes, of course, everyone is welcome. But activities or sensitivity training were universally missing. So judge for yourself by taking some time to rate the facility for yourself. As Parman suggested, take some time to take in the atmosphere and the interaction between staff and residents. Try a meal in the dining room. Walk around the grounds. Would you, your spouse or your parents be happy there? Only you can decide that. Brian Parman is an amazing son and human being. So glad to call him my friend. ?